Hi Friends: It's time for a new challenge over at the SheepSki Designs Challenges Blog! The theme for this month is Girlz Rule! 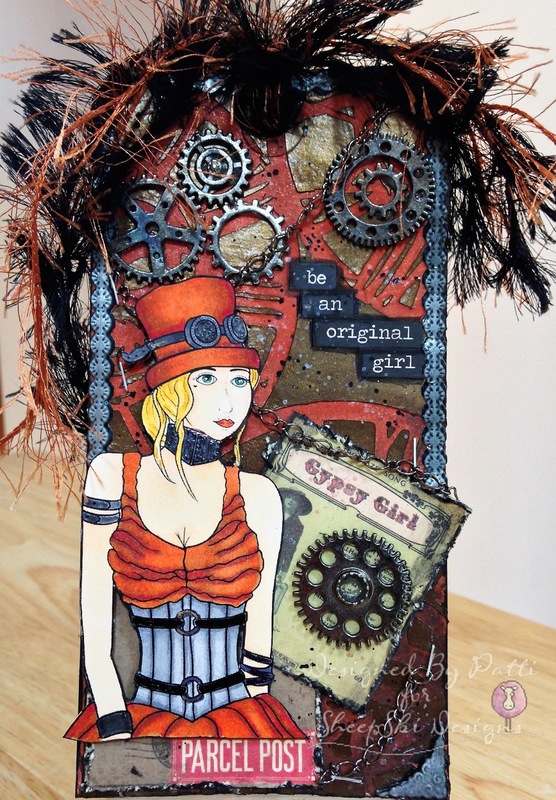 Here's my project for this month's challenge - I used this super digital stamp called Victoria from SheepSki Designs. Print image onto smooth white cardstock and color with Spectrum Noir markers. Fussy cut image, then add black glaze and gold shadow gelly roll pen accents to the jewelry, rings, and goggles. Use stencil and bronze texture paste to add texture to the background of a manilla tag. Once dry, color with Lindy's Stamp Gang sprays. Distress and ink edges of the tag and ephemera and add ephemera to tag. Glue gears to tag, then attach metal chain with stapler. Use Industrious Stickers to edge the tag and add the photo corner at the bottom. Use black gesso and Heidi Swapp white spray mixed with water to add splatters to tag. Use foam dots to add the focal image to the tag, then finish with some matching fibers tied to the top of the tag.